The review paper “Evolution, comparative biology and ontogeny of vertebrate heart regeneration” (1) provides an in-depth comparative analysis of factors correlated with heart regeneration. Either phylogenetically or developmentally, myocardial regeneration seems to be associated with “a low metabolic state, low heart pressure, immature cardiomyocyte structure, hypoxia, an immature immune system and the inability to regulate body temperature.” It was considered that there may be limiting trade-offs involving some of these factors. Having spent a career as a comparative pathologist in the pharmaceutical industry, I appreciated Joe Alcock’s recent op-ed in The Evolution and Medicine Review (Oct. 9, 2016) noting the repeated failures in developing treatments for sepsis. My frustrations with the absence of adaptationist thinking in drug development had previously led me to address the issue (4,5). I stated that the scientific community will soon know what each gene product does, making possible the creation of drugs that can affect each protein. But that mechanistic understanding doesn’t guarantee that the evolutionary function will be understood. Without taking the adaptationist approach, the full understanding of the phenomenon may not be achieved until problems arise in preclinical development in animal models, in clinical trials, or (more disastrously) after the product is on the market. In approaching why myocardial regeneration is limited in mammals, it’s important that we listen for those smoke detector alarms. Luckily, the problem of arrhythmias with myocardial regeneration was discovered early in the therapeutic development process. While it wasn’t obvious what the trade-offs are in myocardial regeneration, it was certainly clear that trade-offs are involved. In many areas of medical research, a more thorough approach that emphasizes asking the whys can help us avoid unnecessary clinical missteps and can help us get to the heart of a problem. Vivien, CJ, Hudson JE, Porrello ER. 2016. Evolution, comparative biology and ontogeny of vertebrate heart regeneration. npj Regenerative Medicine 1:16012. Shiba Y, et al. 2016. Allogenic transplantation of iPS cell-derived cardiomyocytes regenerates primate hearts. Nature 538:388-391. Urbanek K, et al. 2005. Myocardial regeneration by activation of multipotent cardiac stem cells in ischemic heart failure. Proceedings of the National Academy of Sciences 102: 8692-8697. LeGrand EK. 1997. An adaptationist view of apoptosis. Quarterly Review of Biology 72: 135-147. LeGrand EK. 2001. Evolutionary thinking as a tool in pharmaceutical development. Drug Development Research 52:439-445. 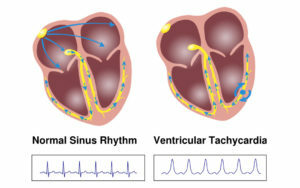 Image showing ventricular tachycardia via TextbookofCardiology.org, by user Drj. Ed LeGrand is to be congratulated for taking an adaptionist approach to the vexed question of why the regenerative potential of the human heart is so limited – resulting in a downward spiral toward heart failure after a severe myocardial infarction. He is interested in possible evolutionary trade-offs which might have limited the higher vertebrate heart’s regeneration potential and singles out research by Shiba et al, which recorded transient, asymptomatic tachycardia in monkey hearts after injection with myocardial stem cells. The implication is that cardiomyocytes in, certainly, primate hearts, experience problems successfully integrating themselves with other resident cardiomyocytes, on having recently arrived on the scene via differentiation from stem cells. Could such tachycardia exist outside the research laboratory and might it therefore be a limiting factor that had mitigated, over evolutionary time, for loss of heart regeneration? Metabolism. To cope with the metabolic demands imposed by a high pressure system, cardiomyocytes transition from glycolysis to the more efficient mitochondrial oxidative phosphorylation. This releases reactive oxygen species which can lead to cardiomyocyte cell-cycle arrest. Temperature. Heart regeneration is widespread in cold-blooded species but regeneration loss is the norm for warm-bloodedness. Given that thermoregulating animals, says Vivien, have a metabolic capacity four times as efficient as non-thermoregulating species, these metabolic adaptations may also have come at the expense of regeneration. Hypoxia. Species that can regenerate heart cells tend to live in hypoxic environments while non-regenerative cardiomyocytes appear to be adapted to an oxygen-rich environment. Structural organization. When zebrafish heart cells regenerate they first go through a process of de-differentiation in which the muscular internal elements of the cells – called sarcomeres – break down. It may be that adult mammalian cardiomyocytes have a sarcomere structure adapted to a very high workload that makes sarcomere disassembly more difficult. Nucleation and ploidy. Zebrafish and newt cardiomyocytes are predominantly mono-nucleated, says Vivien. Human cardiomyocytes are binucleate and also polyploid – and both conditions are associated with cell-cycle withdrawal. It is thought that that polyploidy is an adaptation in cardiomyocytes to increase transcriptional output of genes. Immune system. Non-mammalian vertebrates and neonatal mammals lack immunoglobulins and do not have pro-inflammatory immune systems. There seems to be an inverse relationship, therefore, between regenerative capacity and the development of a mature immune system. These evolutionary adaptations, say Vivien et al, may have resulted from pressures that permitted the development of adaptive immune system mechanisms that promoted animal survival in the face of infectious diseases but resulted in a loss of reparative potential because of excessive inflammation following tissue injury. So. according to Vivien et al, a number of heart adaptations to allow vertebrates, and especially mammals, to pump blood at high pressure, which involve a change in respiratory metabolism, sarcomere complexity, and warm-bloodedness, could all, plausibly, involve a trade-off of an efficient pump against regenerative potential. Vivian et al are at pains to stress the hypothetical nature of all their candidate trade-offs but their analysis is backed up by a comprehensive tour of vertebrate heart regeneration potential and their conclusion that understanding the evolutionary context for heart regeneration potential would provide stronger scientific foundations for the translation of cardiac regeneration therapies into the clinic is spot-on evolutionary medicine. It’s always good to get a variety of views; and of course taking a broad evolutionary approach, or even a more focused adaptationist approach, doesn’t assure agreement. My take on the very limited myocardial regenerative repair in adult mammals comes from looking histologically at large fibrotic areas in hearts with infarcts. There the question is “Why doesn’t the scar get replaced by functional heart tissue?” Clearly (to me, at least), replacement of the scar is well within biological capability. Presumably, therefore, scar replacement is constantly being “explored” and rejected by natural selection. Besides the risk of arrhythmias, one might hypothesize that there may be limitations on getting enough nutrients and oxygen to the site while preserving heart wall strength (e.g., with possible limitations on vascularity in a vigorously beating heart, a fibrous scar providing strength might be less risky than trying to support functional new myocardium). My suspicion is that the role in heart regeneration of low metabolic state (including low pressure, low temperature, and hypoxia) is that it provides the conditions whereby regeneration could be explored and not rejected by selection. In the paper by Shiba et al, the incorporation of injected myocardial stem cells in the infarcted hearts of the experimental monkeys was associated with arrhythmias that were considered asymptomatic. Presumably these caged monkeys weren’t giving their hearts the vigorous workout that might be expected of monkeys in the wild. One of the reasons some harmful effects of new drugs don’t show up in research animals or early clinical trials is because of the limited environmental conditions in the cages or among small numbers of patients (e.g., no exposure to infection or to especially hard exercise).